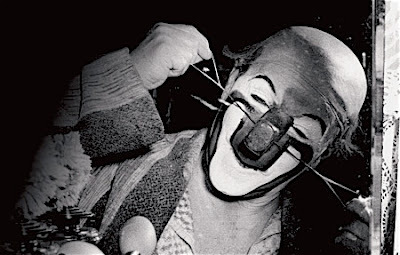 One of the first gags most folks were taught at Ringling Bros. and Barnum & Bailey Clown College performed by the guy who taught it to many of us, International Clown Hall of Fame inductee and former Clown College director Steve "T.J. Tatters" Smith. Steve is assisted here by Jeffrey Steele. 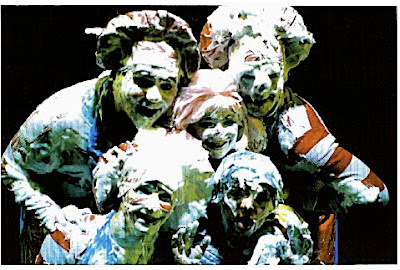 They are introduced by another former Clown College director, Ron Severini. 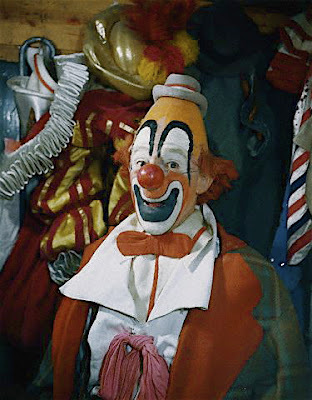 This is from the 1987 Ringling Home Video Be a Clown. 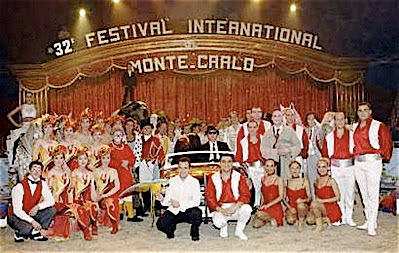 Performers from the 32nd annual Festival International du Cirque de Monte-Carlo (among them International Clown Hall of Fame inductee and 2007 Lou Jacobs Lifetime Achievement Award recipient Barry Lubin) which began last night January 17th and will run through January 27th. Has anyone got any news? The host of this special was Arthur Godfrey, who tended towards "verbal diarrhea" when unchecked. 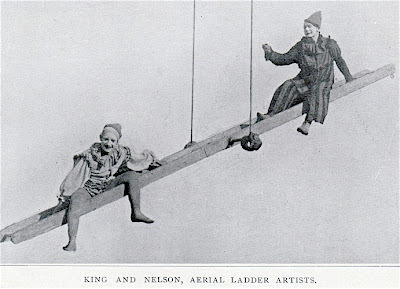 Jacko Fossett with "Little Billy" Merchant on Billy Smart's Circus in 1972. The beautiful Ringmistress in this clip is the still beautiful Ms. Yasmine Smart, one of the stars of this season's Big Apple Circus. For more information on Mr. Fossett, please click the title of this post. 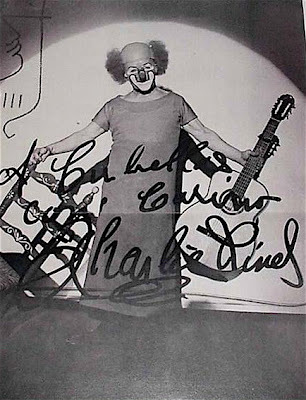 If Ernie got a penny for every time someone used his image to advertise a show that he didn't appear on he'd have earned 100% what he ever did actually performing at the shows that he did over his long career. 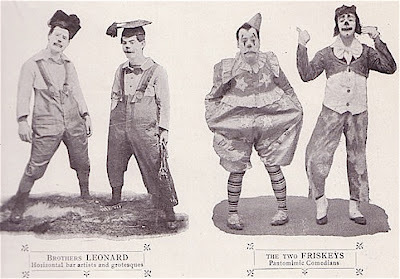 Some of the members of the 1942 Clown Alley of the Ringling Bros. and Barnum & Bailey Circus. 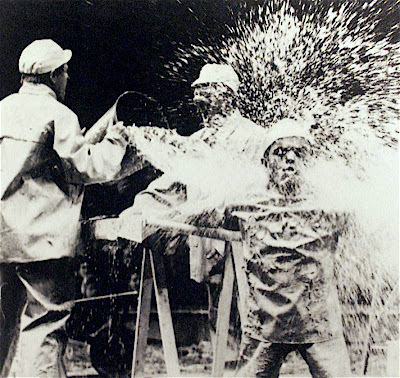 Although it's a great picture, I wonder why Ringling continued to use a photo of Felix Adler that looks nothing at all like Felix's well known face? 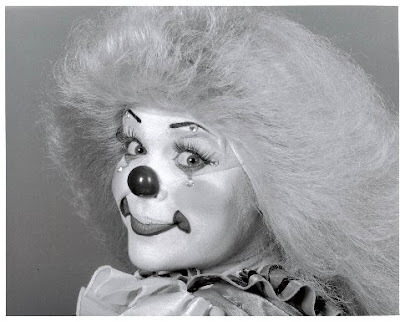 But then again, they used photos of Lou Jacobs in whiteface well into the 1960s. 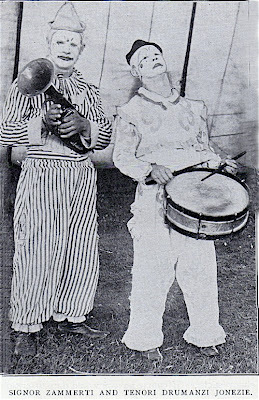 This is taken from a Edward J. Kelty photo of the clowns of the Sells-Floto Circus in South Ozone Park, June 6th, 1932. 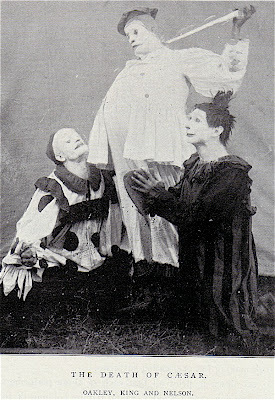 If I had to take a guess, I'd say that the tall whiteface in the center is Chester "Bobo" Barnett. The person to his left and the other person to the far left of that row look to be the Hanlon brothers. 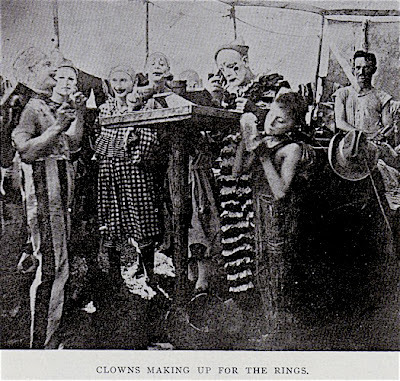 Two to the right of Bobo is Otto Griebling. 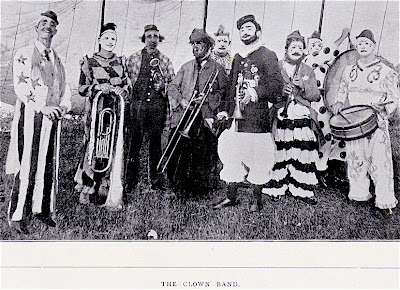 At the far right of that row is a clown who turns up in many Ringling photos of that era (sometimes wearing chicken feet) but I don't have his name. 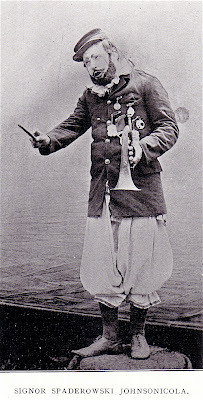 Otto Griebling in an alternate makeup. Paul Jerome in tramp makeup. And now for a bit of culture...the Fratellinis' theme Tango des Fratellini by Darius Milhaudas as performed by pianist Lynn Kamerlin at the Beethoven Memorial, Vienna April 19th 2007. 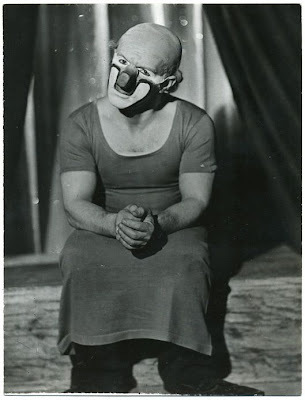 I really love the atmospheric qualities of many of the pre-war European circus clown photos. 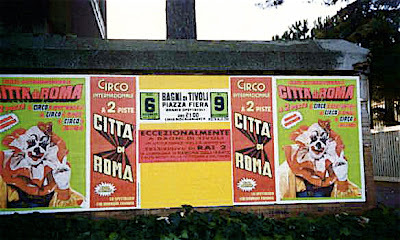 There such are great photographs of artists like Grock, Rivel and the Fratellinis that make wonderful use of lights, darks and shadows and that all but disappears with the post-war rush to color photography. 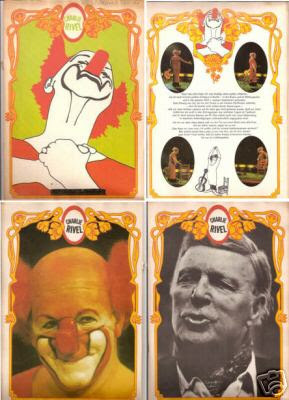 And as an extra added bonus, here are some program pages of Charlie from the op-art/pop-art 1960s. 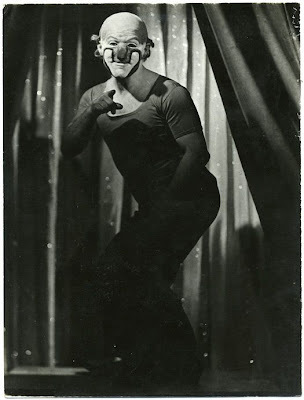 For more information on "Papa Lou" (especially for those circus producers out there among you who might be interested in legally licensing his distinctive and copyrighted likeness from here on in), please click the title of this post. Yesterday clownalley.net almost doubled it's average number of hits from last month. In celebration here is Peter Pitofsky (in black Chuck Taylors) and Wolfi rehearsing for a Teatro Zinzanni underwear party. "Lederhosen, glockenspiel; lederhosen, glockenspiel... jacques chirac!!!" When sung to the tune of Funniculi Funnicula, I really think that just about says it all. 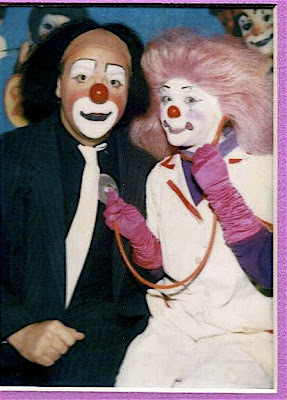 In an effort to help dispel some of the lingering sadness over yesterday's anniversary here are Clown College graduates and former Ringling clowns Peter Pitofsky and (below) Mike Smith. Please click the title of this post to view the website of the Three Rivers Resort in Koosia, Idaho. When making a reservation, remember to tell Mike and Lara that you are interested in the "Big Red One Getaway Weekend" package. 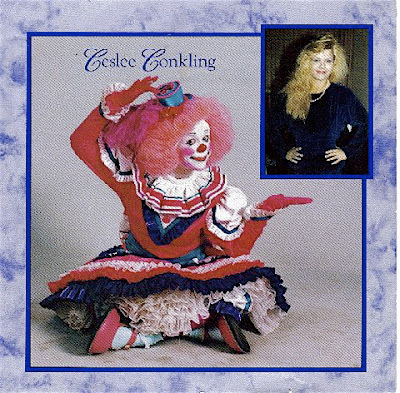 A Graduate of the Ringling Bros. and Barnum & Bailey Clown College Class of 1991, Ceslee was a clown on the Blue Unit from 1992-1994. 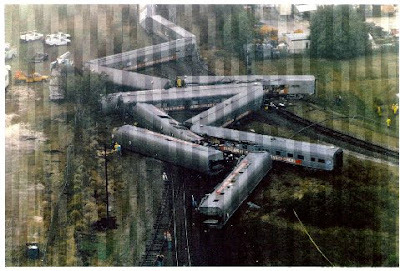 Loved by everyone, she died tragically when the Blue Unit circus train derailed outside of Lakeland, Florida on the morning of January 13, 1994. Always helpful and concerned for her friends, Ceslee was killed enroute through the train to alert everyone of a broken wheel on the Clown Car. Always helpful, always concerned; that was our Ceslee. clown alley to be spotted. The dry cleaning came back and costumes were collected. For the New York Times account of the events of January 13, 1994, please click the title of this post.